What’s the most effective insurance marketing method? The answer depends on many factors, including the age of your target audience. Thanks to rapid advances in technology, each generation has grown up with a different experience, and this has shaped the preferences and habits of its members. To market effectively, you need to know how the generation you’re targeting likes to receive information. Here are some key facts for each generation, as defined by Pew Research Center. Individuals belonging to this group were born between 1928 and 1945, making them 72 to 89 years old in 2017. Gallup research indicates that this group is most likely to use phones (either cell or landline) or email to communicate. Compared to younger generations, they’re not as likely to text or use social media. This generation includes everyone born between 1946 and 1964, making them 53 to 71 in 2017. According to Gallup, people in this generation may use social media, but usually not Twitter. They make phone calls, they text, and they use email. Pew Research Center found that when members of this generation do use social media, it’s usually Facebook: 64 percent of internet users between 50 and 64 and 48 percent of internet users age 65 or older reported using Facebook. This group includes people born between 1965 and 1980, so they’re 37 to 52 in 2017. According to Nielsen, members of this generation are the heaviest social media users. They spend an average of approximately seven hours a week on social media. They use social media for many purposes, including learning about products and services. Facebook is extremely popular for people in this age group. 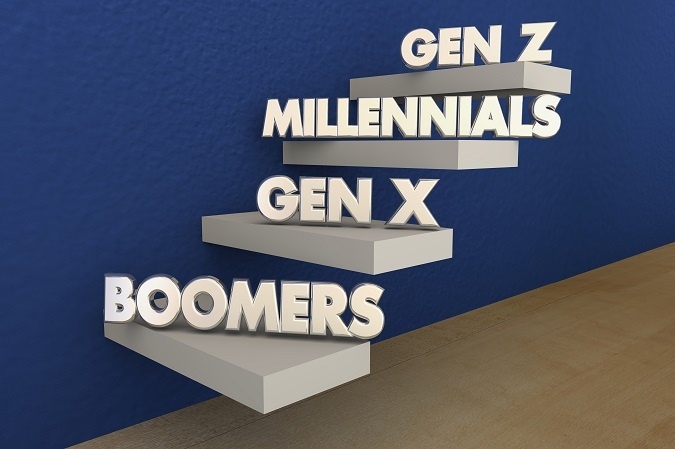 According to Forbes, 81 percent of Generation X members are on Facebook. This generation includes people born between 1981 and 1997, making them 20 to 36 years old in 2017. Millennials are the largest living generation. According to Pew Research Center, as of 2015, it’s also the biggest generation in the United States labor force. For this reason, it’s a generation that marketers want to pay attention to. Nielsen found that this generation uses social media, but at around six hours a week, they don’t log in quite as often as Generation X. Some of that extra time is spent using messaging apps. Pew Research Center found that these apps are very popular with people between the ages of 18 and 29, with 49 percent of people in this age group reporting using them. This is the post-Millennial generation, and people are just starting to pay attention to them. The oldest members of this generation are still teenagers, and they’ve grown up with both the Internet and smartphones, making them technologically savvy. According to Business Insider, teenagers spend a lot of time on their phones. Their favorite apps include Instagram, Snapchat and Twitter. They also use Facebook. Generation labels are helpful for marketers, but you might want to avoid them when you’re addressing your audience. Pew Research Center reveals that many people reject their generational label. This is especially common among Millennials. Get more insurance marketing ideas.